A black and white photograph of 101 Winchester Road East. 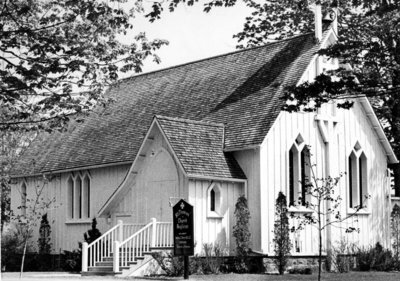 St. Thomas' Anglican Church was built in 1869 and designed by Toronto Architect Henry Langley. Additions were made to the church in 1986/87 and 2008/09. This picture shows the original church at the time it celebrated its Centennial in May 1970. 101 Winchester Road East, May 1970, The Oshawa Times. Whitby Archives 25-000-346.